Our Range of Men's All in Ones are suitable for those with moderate to heavy levels of incontinence. 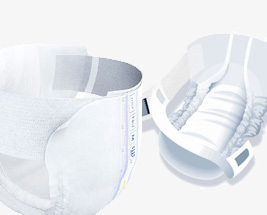 Designed to offer superior absorbency and comfort they are easily put on and taken off due to the adjustable side tapes. All of the products featured in the range have odour control and leakage barriers. Various levels of absorbency are available depending on your needs.